Discussion in 'Business & Economics' started by Believe, Apr 15, 2013. U.S. stocks fell, erasing this year’s gains for the Standard & Poor’s 500 Index, as weaker-than-forecast data from China and tension in Ukraine overshadowed reports showing an improving American economy. In contrast, gold is up from less than $1200/oz to $1368/oz currently for a gain in 2014 of more than 14%. Druckenmiller is one of the world’s most successful and respected traders. As a hedge fund manager from 1986 to 2010, he generated an incredible average annual return of 30%. Druckenmiller was also George Soros’s right-hand man at Quantum, Soros’s famed hedge fund. Quantum’s now legendary 1992 trade shorting the British pound was Druckenmiller’s idea. It made Quantum about $1 billion. That buy is huge and will likely make many who are short run for cover. (buy off-setting long positions). It will take GLD a couple of days to buy the gold corresponding to three hundred million dollars, as they must. I'll be watching the price of GLD shares to see if a run up is starting. GLD closed today on an up tick at $107.11 / unit. I have 1100 units and currently they show a loss of just under 18%. They need to close at (or above) $126.38/ unit, for me to be in the black on them. I think they will in less than a year. For why, see graphs and charts at: http://www.sciforums.com/threads/th...r-more-worse-news.105212/page-59#post-3321580 and in the next post too which has graph/chart copied below with India's increasing buying added on top of China's - Alone those two are consuming total mine production now. Commercial western vaults and vaults of GLD etc. have lost half their gold supplying the recent total demand (Russia and Turkey have been big buyers for some years too). Note the most recent 10 months average is significantly more than global production - Some thing is gona give soon as western vaults can't supply more, and GLD will be a net buyer with Druckenmiller (and others of like mind) forcing GLD to add physical gold to their vaults. You are being a little disingenuous again, "as expected"...seriously? Traders can't tell you with great precision what markets will do with any degree of precision or consistency. The world's greatest investors can't do it and you certainly are not one of the world's greatest investors. Your hope GLD gold purchases will drive up gold prices is a fools game. The gold market is a little more complicated than that (e.g. China is buying less gold). Unfortunately for you BillyT I'm not making stuff up. The price of gold, like any other commodity, is determined by supply and demand. It really is that simple. However, there are many factors influencing supply and demand. So for you to focus on one or an irrelevant one and ignore the many others as you like to do is just wrong. It leads to wrong decisions and lost money (e.g. gold falling from 1.9+K per ounce to 1+K per troy ounce). Inflation is zero, and there is little if any inflationary expectations. That is a downward pressure on the price of gold. Fear, well there is some fear. At this point, there is significant fear with respect to China's ability to weather its current economic problems and whither its economic problems will cause political instability within the country. All of that is exacerbated by China's lack of transparency. And then there is concern with respect to Putin. Lord knows what Putin will do, but things aren't getting any better in Mother Russia or in Ukraine. And then there is the prospect of war in Iran. Yeah, there is plenty of reason for geopolitical fear, and that is an upward pressure on gold. The best reason to buy gold now would be as a protection from some destabilizing geopolitical event. That geopolitical event could well be China. Some central banks have been and continue to be buyers of gold - usually less developed countries like India, China, and Russia. China has cut back on its gold purchases and I think it likely it will further reduce its gold purchases in the coming months. That's neutral to a negative pressure on gold prices. On the supply side, I don't see any supply shocks and in particular any contraction in the supply of gold at least on the near term if gold prices remain at or above production costs. So that is a neutral or a slight upward pressure on gold prices. Last but not least, is the value of the US Dollar, and the US Dollar is rising. If the Fed increases interest rates next month, the US Dollar will increase in value and that will put significant downward pressure on gold prices. Given China's economic instability and US dependence on China, it would be foolish for the Fed to increase US interest rates at this time. And I don't think this Fed is foolish, though it does have a few foolish members. So when one looks at all the drivers of gold pricing, the bias is towards the downside. But since none of us have a crystal ball and we don't know how events will eventually play out, no one knows where gold prices will go over the coming months. Two, only a fool would make an investment case out of a single day or historical price variations. Current and future prices are based on current and future expectations and not historical expectations. If you could relive the past, then the past data would be relevant. But you cannot, so it isn't. We don't have time machines. No. For years the POG has been set by the "paper gold" traders at Comex (and others) as that market is at least 100 times larger than the market for physical gold; However the physical gold market is sort of a one way street. Gold come out of the ground from all over the world and moves to Asia, especially China. The western vaults have been suppling the excess of demand over production and re-cycling for several years now, but are essentially empty (or hold gold owned by "strong hands" with ETFs like GLD owned deposits. For example, my gold at GLD will not come to market until POG is at least 2,500 dollars/ oz). We are thus near the SHTF day when demand for physical gold can not be met, with out significant price increase. Never has "backwardation" been so bad and long lasting. I. e. buyers are paying more for promisses of future deliveries than the current price of gold. They do this in the expectation POG is going up and they can tie up many times more gold for the same current cost of a Kg of gold delivered now. Another strong indicator of SHTF day approaching is the last curve below at end of this post. Almost 300 people have "paper gold" claims on the same ounce of physical gold - The leverage has never been so extreme. 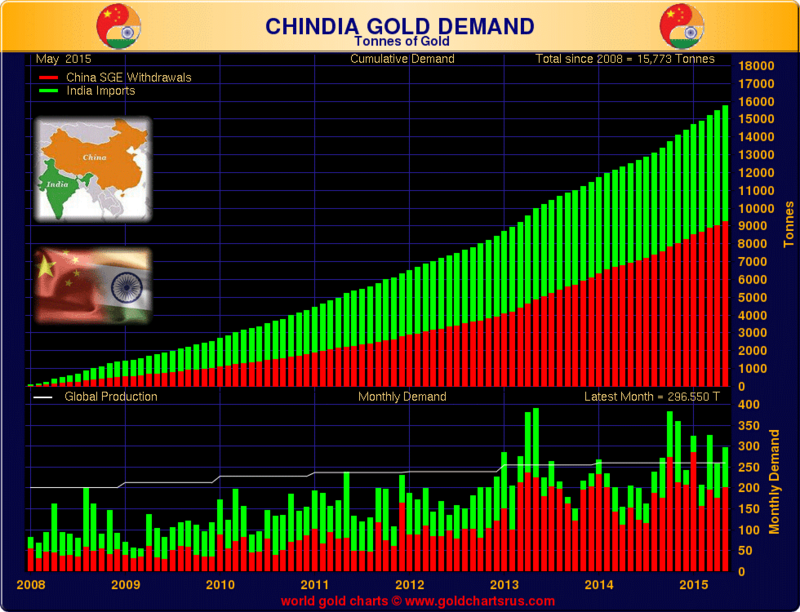 China now hoarding gold, at current low price, by > 10,000 metric TONS per week! Russia and some other big buyers are hoarding gold too, but can't buy as much as China can. China is world's largest producer too, by about 40% more than #2 produces, but hard data is not vailable. While gold prices trade near a five-year low, central banks around the world are snapping up the precious metal. To give you some perspective, the annual global gold mine production is around 2,800 tonnes. So in the past five months alone, China’s central bank has purchased 24% of the entire world mine production for 2015. Despite its "sick economy" Russia is a big buyer of gold too. Converting its dollar reserves into gold. Except you are wrong BillyT. This nonsense about physical gold and paper gold is just that, nonsense. "Paper gold" is a gold derivative contract. It isn't the same as gold. "Paper gold" is a right to do something, usually, to buy a certain amount of gold at a given price within a certain period of time. In many respects "paper gold" is similar to an option contract. In many if not most of these cases, contracts end with just a simple exchange of money. No physical gold is purchased, sold, or transferred. And as previously discussed, the Russian central bank is buying gold out of necessity to prop up its domestic gold producers. The fact is, gold is down more than 10% this year alone. Over the course of the last 5 years it's down more than 23%. Gold hasn't been nor is it likely to be a good investment in dollar terms because by all accounts to the US will begin to raise interest rates in a few weeks. That means the dollar will become stronger and commodities like gold will become cheaper. Because by definition, a stronger dollar buys more stuff. That means gold becomes even cheaper in dollar terms. And that is one reason why gold prices have fallen through the floor. If people must buy gold, numismatic gold is the best way to go. Because the value of of the product is more numismatic than commodity related. I have this idea that the price of gold will be manipulated downwards quite sharply, tumbling in greater failure after the $1000 mark is breached. Perhaps we shall see a price of $600-$700. But this will be like the drawing back of a bowstring before the shooting of an arrow. Those who control the hidden forces that guide these matters were never going to invest patiently for a steady rise in price. That is not their way. They want to cash in on a spectacular rise from a lowly starting point before they arrange for the world's major currencies to collapse under the burden of accumulated debt. * That much is being taken from SGE weekly now. you are equating the potential from leveraged gold via gld(the contracts) to a potential short squeeze? so you are equating the potential from leveraged gold via gld(the contracts) to a potential short squeeze? Yes. It is quite amazing it has not yet happen. Now on 1 of the ~300 with rights to ask for the ounces of gold promised to him and 299 others, needs to get scared that some one else will want it instead of a cash settlement to start the run to SHTF conditions. Most of the physical gold in ETFs, like the largest GLD, has already been drained from their vaults, remelted into the smaller bars demanded in Asia (especially China), mostly in Switzerland and sent to Asia, never for decades at least to come back to the market place. Unlike paper gold promises, you can not just print some more promises to meet physical demand. The owners still with non-levered claims on the remaining gold in those vault, like me, are thinking that when physical demand can not be supplied, the POG will soar - must be much higher to get increased mine production* and more recycling of old gold watches, wedding bands, etc. * It will take some years even it POG doubles to increase gold production significantly as exploration ceased a few years ago (the well qualified geologists are now selling cars, etc.) and higher cost mines have been shut down, without even safety monitoring cost being paid. PS you said: "gld" but GLD is not leveraged gold like COMEX. It is well run under English law, audited frequently, (by different firms) and daily publishes the contents of the vault, with serial numbers of the bars in the most complete on-line versions. Only if you have 100,000 shares can you ask for delivery but as more shares are sold than redeemed, they buy the equal amount of physical. The fact that the rich and gold dealing firms do put together 100,000sh (or more) an take delivery, is what keeps the shairs trading at very slight discount. putting more downward pressure on commodities? putting more downward pressure on commodities? likely? The dollar is "strong" only so long as there are buyers for new debt. -US debt is ever increasing and maturing debt must be "rolled." Currently (a few years ago - have not looked recently) the main buyer of US debt is the FED (75 or 80% of the total). How high can that perventage go? Remember at least 10% are buyers, like life insurance companies who know quite well how many dollars they will need to pay out each future year, so they buy Treasuries in that amount with that maturity date. They don't care if when they pay the recently widdowed lady her $100,000 it will not cover two months of her rent - they preformed as the policy required. if the government owes the money to the federal reserve, does it ever have to be repaid? Is it not a fiction, a fantasy, a puff of smoke with no firm foundation aside from paper shuffling or flashes of light on a computer screen? Actually, it isn't amazing for the aforementioned and often repeated reasons. Your premise is deeply flawed. That's why your premise didn't hold up when gold sold for 1,900 dollars per ounce and still doesn't hold up after a nearly 900 dollar per ounce price decline. The volume of gold derivatives isn't reflective of gold demand. It's reflects the level of price speculation in gold. And if you look into derivative pricing, you will find, investors are speculating gold prices will fall. That same ounce of gold isn't hasn't been promised to 300 other buyers. That is simply false and that is why it will always be wrong. A month or so ago I thought about buying some more shorts against gold (some of those derivatives you like to write about), but the price for those shorts was too high. So I didn't buy. The gold shorts were saying the market expects another 10-15 percent decline in prices next year. The market is projecting 900 per ounce gold next year. At those prices, there's not much meat on the bone unless on thinks gold prices will plummet below 900 dollars per ounce or you want to do a naked short, and I don't do naked shorts. That's too much risk for me. Gold may well go below 900 dollars per ounce next year, but I think there are better risk-reward opportunities. Well, you are going off the conspiracy deep end again friend. Unfortunately, I think you are dreaming. The fact is there is a glut of gold, that's why gold prices have plummeted and that's why they are going down even further. And I regret, that is going to hurt you because you are long on gold. But you are not alone, many others have suffered and will suffer the same fate. Well, I'm not sure what you point is, but yeah the US debt and world debt problems are overblown and overstated. Seven years ago, all these naive and ignorant folks, mostly right wing conservative, were running around screaming the sky is falling because of the government bailouts and quantitative easing, and by God, all that money was going to cause Weirmar Republic style inflation...better buy your gold. How well did that work out for them? The fact is those folks didn't understand monetary policy, inflation, and macroeconomics and they still don't. And frankly, I don't think they, even now, want to understand. They would much rather be angry. Well here is the thing, you need a logical reason for those things go happen. I can get the reasons for a decline in gold prices. But, I can't see any good reason to drive gold prices higher. If you believe we are all going back to the dark ages, gold makes sense. If you think we are headed for skyrocketing inflation, then gold makes sense. If we go back to the dark ages we all will have to worry about more things that gold prices. And there is no indication of inflation or reason to believe the Federal Reserve will allow excessive inflation. Currently, inflation is virtually zero, even with the bailouts, the stimulus, and deficits. And there are very good and sound economic reasons why that is the case. As I have previously posted, the Federal Reserve has some very powerful tools which allow it to control the money supply and inflation rates. So, I just don't see any good reason why the Fed would allow the hyperinflation needed to drive gold prices higher like an arrow in flight. Except, that isn't true. The dollar is strong and will remain strong so long as the US is a major economic player. The value of the dollar is derived from its purchasing power, not who buys American debt. The rolling of US debt has nothing to do with the purchasing power of the US Dollar. As US interest rates go higher, the dollar will become a more attractive investment thus creating more demand for US Dollars, that will lessen demand for investments in developing countries. More people and institutions will invest in US investments, including US debt. So it's bad news for countries like China, Brazil, India, and Russia and at a time those countries can ill afford more bad news.